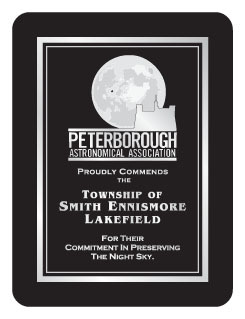 This plaque was awarded to the Township of Smith-Ennismore-Lakefield, on March 25, 2008, for their commitment to preserving the night sky. The township already has light pollution abatement in their noise and property standards bylaws. They currently require all commercial developments to submit site plans showing how light trespass will be avoided before a building permit is issued. They have committed to changing all of their street lights to full cut off fixtures as the existing ones break down and to have all new ones be full cut off. And they are being true to their word as they have recently redeveloped the Lakefield-Smith Arena parking lot with ornamental full cut off fixtures. 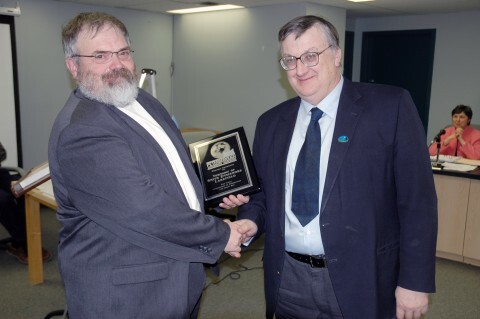 Copyright © 2006 - 2019 Peterborough Astronomical Association -- a Proud Member of the International Dark Sky Association.